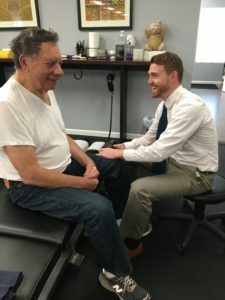 In addition to Corticosteroid Joint Injections and Physical Therapy, Monmouth Pain and Rehabilitation in Red Bank, NJ offers Viscosupplementation to relieve Knee Pain as well as Osteoarthritis of the Knee. The knees are major load-bearing joints that are often affected by trauma, repetitive stress injuries, and osteoarthritis, a degenerative disease of the joints of the body. In all cases, knee pain may prevent sufferers from participating in normal activity and movement. Painful friction may result when the cartilage of the knee degrades. For many patients, knee pain can seriously limit activity and make everyday movements difficult or impossible. Fortunately, there are healthy, conservative methods of reducing the pain and symptoms common to the knee joint. Some patients may benefit from acupuncture (for pain relief) or physical therapy. Because the severity and cause of pain varies between patients, Monmouth Pain and Rehabilitation also offers interventional pain management strategies. In particular, the past ten years or so have seen a breakthrough in the treatment of knee pain: Viscosupplementation. We work with Medicare and most major insurance providers. If you are interested in finding out more about our injection services, or to schedule a consult, please call 732-345-1377 or fill out the form below. Now accepting Medicare patients, and we work with most major insurances. Patients suffering from knee pain often have lower concentrations of hyaluronic acid in their joints. This substance occurs naturally in the body and is found in the lubricating synovial fluid of the joint. When this is depleted, the result is additional pain and inflammation in the knee. Viscosupplementation supplements the viscosity of the joint fluid with the injection of hyaluronic acid into the knee joint. By using Viscosupplementation, additional lubrication is provided to allow the bones of the knee joint to move comfortably over each other. This procedure also provides additional cushioning for better shock absorption, and produces an analgesic effect. Viscosupplementation has been shown to relieve pain in patients who are unable to benefit from medications or rehabilitative practices. At Monmouth Pain and Rehabilitation, our goal is to relieve pain while helping patients heal and regain normal mobility through healthy practices. In many cases, patients are then able to steer clear of unnecessary surgeries and—what is especially relevant for knee pain patients—avoid the overuse or long-term use of oral analgesic medications. Viscosupplementation is incorporated into our practice in order to reduce pain and assist the body in the healing process. Please contact our office to learn more about Viscosupplementation for knee pain in our Red Bank, NJ office.